Hello and Happy Friday! We think you're going to LOVE this month's Art Recipe theme - Architecture! It is a perfect fit with Finnabair's line of Stone Effect Pastes which come in Pumice, Limestone, and Concrete, each with a different effect. Add in a touch of Impasto Paints with Molds and you have a wonderful recipe for creative success. Hello, friends! It's Bipasha here and I am so happy that I can be a part of this amazing "Prima Art Recipe" Team again! This time I have designed wall art for you, drawing inspirations from the beautiful architecture in the lanes of France. Old door and architectural antiques are my obsessions! I started with a blank ply-board and gessoed it randomly using Heavy White Gesso. Then I created my door composition using the Silicone molds & Paper Clay, followed by adhering random rectangular foam cut-outs to create an illusion of bricks. After that, I generously applied the Stone Effect Paste and dried it thoroughly. These pastes are opaque with matte stone-like finishes that come in Pumice, Limestone, and Concrete, and are perfect for creating a natural looking texture and adding dimension. 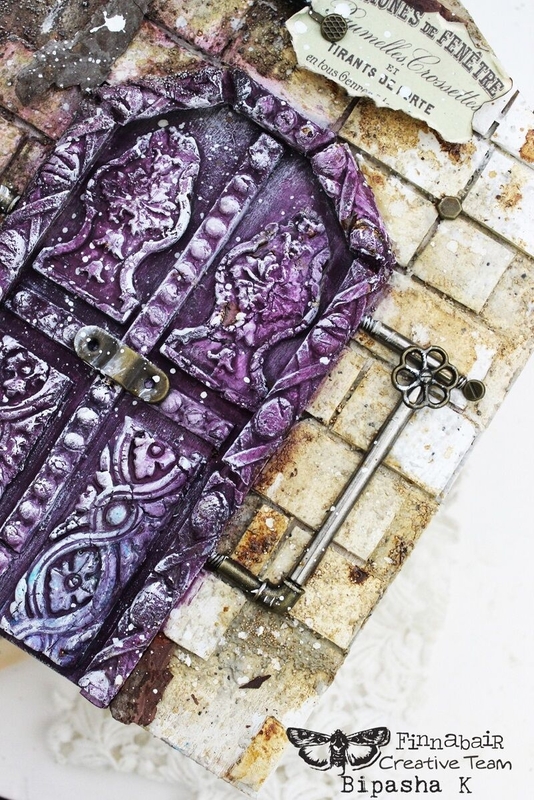 The next step involved painting the door with Art Alchemy Impasto paints (Aubergine, Heather, Azure), followed by some dry brush strokes of Impasto paint in Snow White to reveal the beautiful details in the molds. It was a breeze to work with the Stone Paste. It left me with a realistic "stone" look-alike faux wall, once I added Impasto paints in Dark Chocolate & Raspberry Pink, combined with some coffee stains, Yellow Rust from the Rust Paste Military Rust set, and Heavy Black Gesso. Finally, I added some Junkard Finding water pipes to give my composition an industrial twist. I started my project by creating a composition of different moulds, plus wooden and chipboard shapes. I primed the lower part of my canvas with Heavy Black Gesso and the upper part of my composition was created with Art Extravagance Black Sand Texture Paste, applied through the Harlequin Stencil to add more variety to the shapes and textures. When all this was dry and ready, I began to paint. I started with Impasto Paints and created beautifully rich tones on the upper half of my composition. Also, with the help of the paints, I did some shading to create the effect of an open door. A little bit of dry brushed Snow White paint for more light and a feeling of surfaces weathered by time and my piece was ready! Be inspired by the beauty that surrounds you and you will find many extraordinary ideas waiting for you there! Hello, my friends! 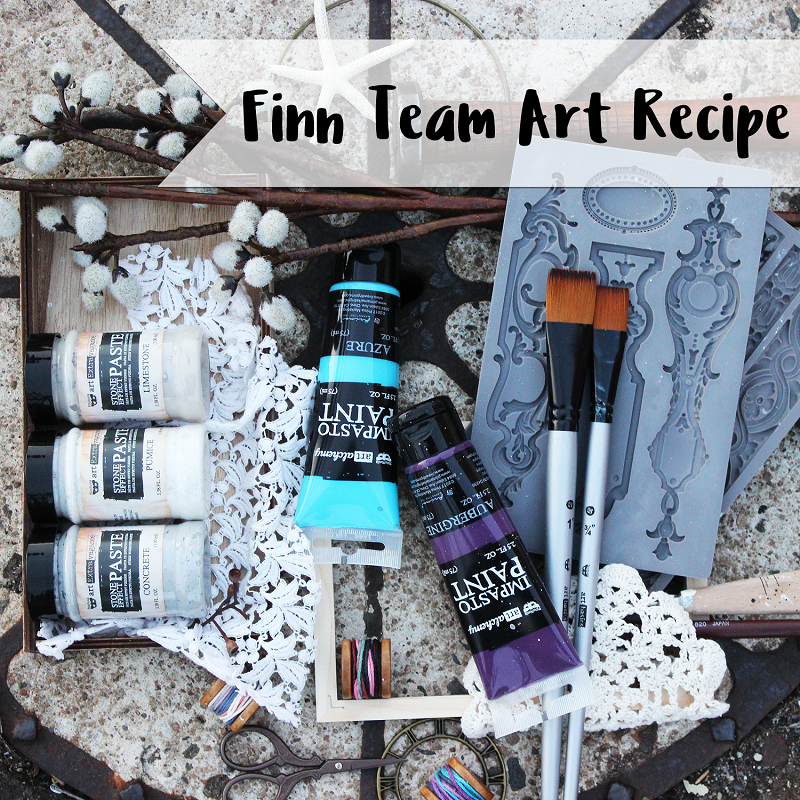 I was delighted when I was asked to create a project for this month’s Prima Art Recipe. Why? Because I loooove Prima and Finnabair products and I was also very inspired by the theme. So, I created a collaged wall secret garden, a very easy and quick project that I hope you’ll like. After I gave my board a coat of Heavy White Gesso and dried it with a heating tool, I marked with a pencil where I wanted my garden entrance to be. 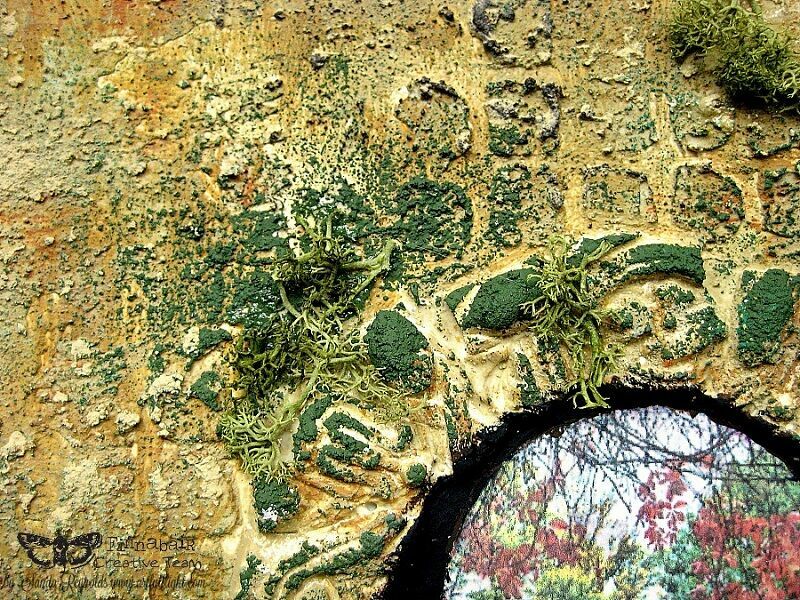 I mixed Stone Effect Pastes (Pumice and Concrete) with Modeling Paste and spread it through the Netting Stencil, creating the wall around the garden. Next, I broke pieces of air dry clay I created using one of Prima moulds and glued them down with Modeling Paste, building up an arch. I left everything to dry and then I collaged my photo using Soft Matte Gel. 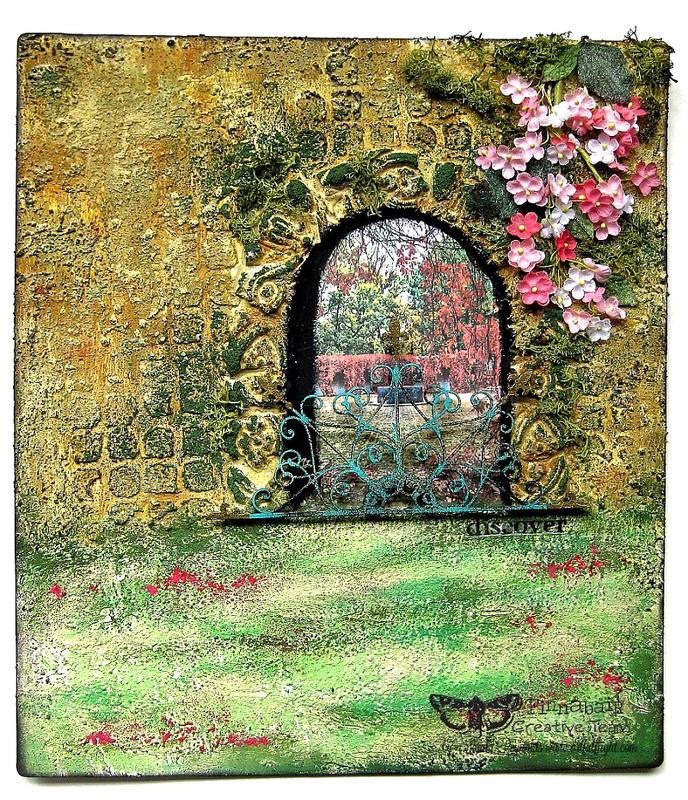 I painted the arch, the wall around it and the lawn in front of the garden using Art Alchemy Impasto paints and the new Finnabair Rust Effect Pastes. The effect created by mixing the Stone Effect Pastes with Impasto paints and Rust Pastes is just incredible – you can create gorgeous textures that mimic to perfection the natural look of an old wall in minutes! As a finishing touch, I added a chipboard “gate” and some lovely, tiny flowers and moss. I hope you’ll feel inspired by my project and try to create your own mixed media “secret garden” using these utterly fabulous products. Finn's team is always a HUGE inspiration for me. 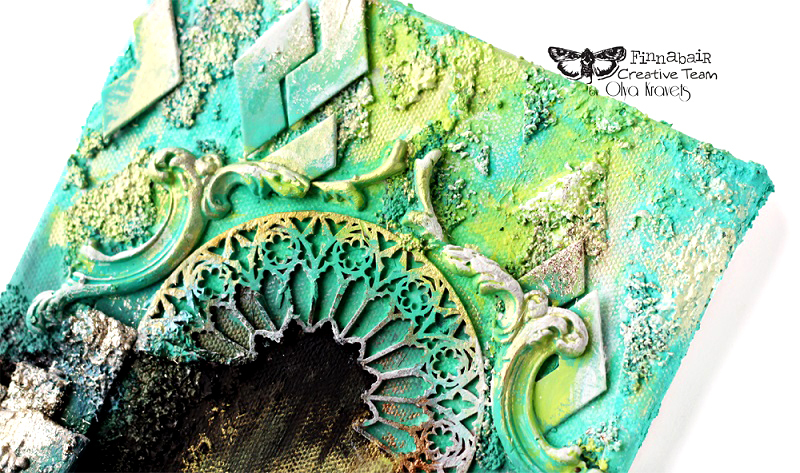 These gals know their mixed-media products and always create new, fun ways to use them! Make sure you check out each of their blogs for even more inspiration!